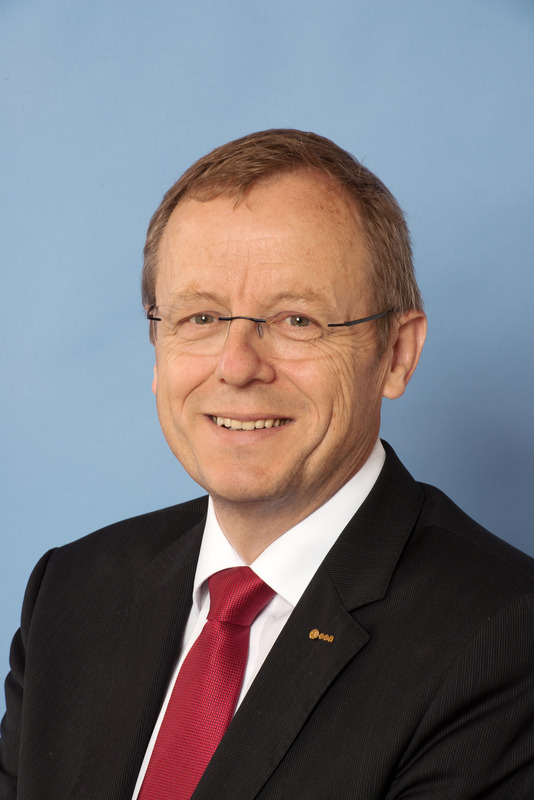 Jan Wörner, ESA Director General. Image credit: ESA, P. Sebirot. The headline sounds a little bit like “My first day at school”, and in fact it is similar: My new role as Director General of the European Space Agency demands a lot of learning. Learning should lead to personal knowledge and the ability to act beyond previous boundaries. These boundaries are at the same time personal limitations and institutional borders. It is my clear endeavour to guide/lead/support/realise the European space activities on the sound foundation of the existing structures, but also to adapt ESA to be able to tackle actual and future challenges. While we are observing a tendency (not only) in the European Union to focus more and more on national interests, it is my determination to strengthen the European spirit in ESA, consisting of the staff, the executive and the member states at the same time. In addition, the external ESA community, such as industry and our scientific partners, is part of the overarching activity for a United Europe in Space. This task can only be successfully realised if the support of the different actors can be mobilised. Let’s go for OUR ESA! I really appreciate your humility and how down-to-earth (pun intended) you are. All the best to you and the ESA, and a huge thanks for the Yoda quote. Keep looking up! There was talk of a lander for the JUICE mission. Is that idea gone forever or could we see it come back? I wad just told that no lander is planned. Поехали! – Poyekhali! – Let’s Go! Congratulations… and GO AHEAD whit the ESA excitant mission !!!!! I wish all the best to the new Director General Johann-Dietrich Woerner! I think that he is the best successor to Jean-Jacques Dordain. Congratulations …. and GO AHEAD whit ESA excitant missions !!!!! “Do….or do not. There is no try.” That is a very good start! “Be the power with you”! A fresh spirit, at last. I look forward to joining the movement towards even better ESA! All the best, Jan, with OUR ESA ! I wish to go advance successfully this wonderful challenge of the ESA !!!! Congratulations and all the best from us all here at the home of the early history of spaceflight! We look forward to seeing you at The British Interplanetary Society in London sometime soon. I like that you realize the importance of Europe these days: quote – ” it is my determination to strengthen the European spirit in ESA”. May I suggest you to work towards getting rid of the hiring stop on over-represented nations within the YGT programme, which serves no purpose but that of discriminating young individuals (and their CV) on the basis of their birth place. Thank you, Jan, for your words of wisdom! All the best in your position. Jan: Very proud and very pleased to know and work with you, looking forward to many years of exceptional collaboration in space! I wish you all the best for your Great Job as Director General . Du rockst das Jan. Alles Gute!!! Eager to be with you to realize “Our ESA” and Space 4.0. Ich freue mich auf OUR ESA!!! Ich hoffe, Sie bekommen eine riesengrosse Schultüte. May the force be with you. Congratulation for starting with a blog. Digitalization is at the heart of the 4.0 revolution and ESA must lead there also! We Airbus Group being a European success story I’m sure that my bosses are more than willing to help you and ESA continuing to build and reinforce together great European spirit! I am glad to see that you are determined to push for an European spirit within ESA, and hopefully across the whole continent through ESA. Space achievements are and will be a pillar for an European identity, at the very least as a testimony to what we can do when we are truly united. In an interview to Der Spiegel (http://www.spiegel.de/international/world/a-1038694.html), you acknowledged that Europeans aren’t bold enough when it comes to space exploration. Well, we need to be bold. Europe, broadly speaking, would like a real, independent manned programme, but individual nations within Europe are not as warm to the idea of spending too much money there. It is a good start to recognise the issue, and I hope you will strive to address it the best you can. We are after all, a people of explorers. It would only be natural that we live up to that legacy by being in the driver’s seat of space exploration. I have of course no idea of how difficult it must be to be at the helm of an organisation such as ESA. I am just stating what I would love to see, as a humble European citizen, hoping that is within the realm of possibility. I wish you all the best in your new position! Great ideas demand a wise spirit! The coming task of ESA will be realized perfectly by our new Director General of ESA! Thanks a lot,we are happy about it! Participation in space, working on that with ESA Summer of Code in Space 2015! We are doing our part, have a great time with your part, but collaborating together for the benefit of all. We are looking forward to it. It will be great! I’m repeating all the welcome and best wishes messages, Jan. And want to say how very much I appreciate that you are beginning your own blog and how much I look forward to reading your posts in future. You hit the mark exactly with the phrase “OUR ESA”. I – who have never worked in the space industry – am immensely proud of ESA and forward news of it to my friends around the world. One friend, in the USA, commented that she feels that ESA is now the world leader in space. Not, obviously, in money spent, but in the excitement and enthusiasm that is a palpable part of ESA. I’m sure that you are going to be a wonderful successor to the very much admired M. Dourdain. Kawabunga ! Meister Woerner ! The show must go on. It was fun and inspiring with Jean-Jacques Dordain, let’s continue and dance to the rythm of Space 4.0 ! All the best from DLR-MUSC. I am not european, but I follow all space related news. Live long and prosper ESA, and all other peaceful space agencies, as we are one humanity, let space unify us. I wish you a little bit of that magic and lot of success! ich wünsche Ihnen für Ihre neue Aufgabe bei der ESA sehr viel Erfolg. Würde es begrüßen, wenn unter Ihrer Leitung mehr Begeisterung bei den EU Bürgerinnen und Bürgern für die europäische Raumfahrt aufkommt. Dazu schlage ich folgende Maßnahmen vor: Unterrichtsfach ” Raumfahrt” in allen Schulen der EU Pflicht u.a. mit Übertragung aller Raketenstarts und wichtigen Projektereignisse. Diese sollten in naher Zukunft in Europa (neue Antriebe) stattfinden und nicht mehr in Südamerika. Bürger und besonders Schüler, möchten vor Ort in Europa bei einem Start dabei sein. Mehr Begeisterung hilft bei der Finanzierung der Raumfahrt! What is a European Spirit ? is the way the GREEK case is handled by EU is a EU spirit ? or the imposed austerity, part of the EU spirit? all in all there is no such a spirit , only nations behind it 🙂 We are not USA, we are not a nation but 30 nations ( for the time being). Please define the EU spirit ? this reminds me the slogan “spirit of a company” “one company”… whilst the innovation spirit, technology leadership spirit …these are slogans that will for sure bring the consensus about an EU spirit -:) Wish you a lot of success ! ESA is not a EU institution. It receives money from its member states – some of whom are not EU members. It also receives money from the EU for Copernicus & Galileo..
Congratulations mister Jan Wörner and a great start at ESA ! Ariane 5 Core plus 4 Ariane 4 side-boosters as a manned launcher. Ariane 5 Core plus 4 Ariane 4 side-boosters as a manned launcher, page 2: use as another ISS supply vehicle. This new esa director general I like! I am very glad to see your ideas to strengthen the European Spirit and pushing for science and expanding mankind’s horizons. Achievements in a multicultural teams are an important contribution to peace in Europe and a valuable objective of ESA. I hope you will manage to explain to member states that they get back more than only industrial contracts. I know you must be very busy, but you have gotten a lot of people interested in your Lunar Far Side base idea. Could you write a blog about that? Do you plan to hold workshops or otherwise start promoting it as a new ESA activity?